drummers are funny people. but everyone knows that. here is the holiday club drummer. bass players and drummers have to be telepathetic … he’s got a telly and i’m pathetic. [joke to be removed by quality control at a later date]. 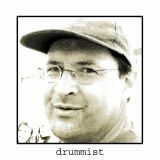 I think there is a conspiracy against drummers/drummists/drummaires/drummedaria (that’s a drummer with only two drums – or is that ine drum?, anyway, there is a conspiracy perpetuated by bass guitarists who wish their plectrae (plural for plectrum) were drumsticks! you are just jealous because your electronic drumkit simply functions on 12 volts (DC) whereas my bass amplifier positively thrives on a direct 240 volts (AC).